Manoir de Saule – Suitably positioned for visiting the world famous World War 2 Normandy Invasion Beaches, (Utah, Omaha, Gold, Juno and Sword) used by the Allies during the initial D Day beach landings June 6th 1944, the many large and small concrete bunkers and gun batteries that remain today forming what was part of the infamous German defensive Atlantic Wall, the many excellent associated museums and other historic places of interest and most importantly NOT FORGETTING, the emotionally thought provoking cemeteries of the fallen on both sides engaged in the Battle of Normandy. All the best places to visit within the American Sector including the sites described below and many more are within a ½ hour drive including the now, peaceful, beautiful sandy beaches of Omaha and Utah. 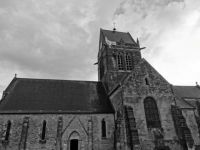 Sainte-Mère-Église – Paratroopers of the 82nd Airborne Division land in and around the town during the night of the 5th and 6th June 1944 (D Day) and find themselves in the centre of a fierce battle with the Germans. During the operation, Trooper Private John Steele lands upon the Church roof and becomes suspended for two hours from below his parachute snagged upon the Church Steeple whilst the fighting continues below. Today, an effigy of John Steel can often be seen dangling from a parachute as a reminder of what happened – a scene famously captured in the epic 1962 film, ‘The Longest Day’ staring John Wayne. 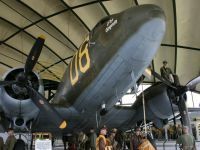 The ‘Airborne Museum’ in Sainte-Mère-Église opposite the Church, houses a large, impressive array of interesting artefacts including a C47 cargo plane and a WACO glider that were used during D Day and beyond in the skies over Normandy to carry Paratroopers and their equipment to their jump and drop zones. Originally opened in the mid 1960’s and since having had various fantastic display areas added on the site, the museum with some 10,000 mainly American exhibits, remains high on the list of museums to be visited. 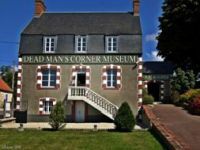 Another extremely impressive museum, Dead Man’s Corner in Saint-Côme-du-Mont. On 8th June, after going through the hedgerows and fields of the Normandy countryside, the Americans throw all their forces into battle and reach the surroundings of St-Côme-du-Mont. The first tank arrives at the crossroads and attempts to continue towards Carentan. It comes to a brutal halt when it gets a direct shot that kills the tank commander, Lt. Walter T. Anderson from Minnesota. From this day on, and for several days, the wreck of the tank and the corpse of Lt. Anderson hanging from the gun turret will stay on the spot. For the Americans, this location will always remain the “DEAD MAN’S CORNER”. Owing to our central location, we are also within one hours easy drive of Mont. St. Michel, the Benedictine Abbey which dates back to around the year 500. The Abbey, the third most visited place in France is visited by people every year from all around the world. Within 40 minutes drive, the medieval town of Bayeux with its famous Bayeux Tapestry is truly worth seeing. 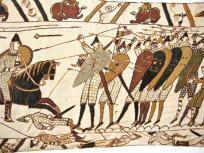 The embroidered cloth measuring 70 meters long comprising of 50 scenes depicting the events leading up to the Norman Conquest of England concerning William, Duke of Normandy and Harold, Earl of Wessex culminating in the Battle of Hastings in 1066. We have a number of fantastic golf courses in our region. With such a selection from which to choose, all levels of golfing handicaps are catered for. Five of the best courses range between 5 to 50 minutes drive and offer 27 hole, 18 hole and 9 hole challenges. We can make reservations for you in advance of your visit, organise your tee-off times and pre book golf buggies as you require. On selected days we can provide (by prior arrangement) transportation to and from your chosen golf course. Any information on these golf courses including prices can be forwarded to you on request. For those who have a love of all things Equestrian, within our area we are privileged to have two of the most prestigious National Studs in all of Europe one of which is on our doorstop in Saint Lô, and the other near Argentan. Built in 1806 at the request of Napoleon, whose campaigns necessitated large numbers of horses, the National Stud at Saint Lô was virtually destroyed by bombing during the Second World War and has undergone substantial renovation. Open to the public every afternoon from June to September, with stallion and driving displays on Thursday afternoons from the last week in July to the first week in September in the main courtyard at 3pm. 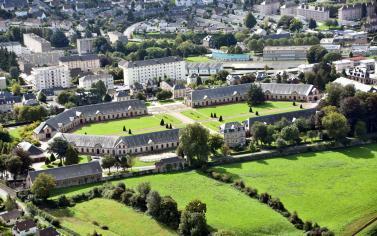 Of the 22 national studs in France, the stud at Saint Lô is considered to be the most important given the number of stallions standing there and the large number of equestrian events it hosts throughout the year. 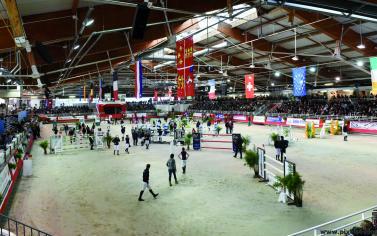 No wonder the Stud at Saint Lô promotes itself as being the ‘sport horse capital of Europe’. 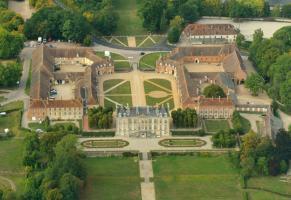 Built in around 1715 on the orders of Louis XIV, the Haras du Pin set within 1,100 hectares, is a superb monument to the horse both past and present. Open to the public every day, the stallions and carriage horses are presented each Thursday afternoon from June to September in the central courtyard at 3pm. There is a wide range of equestrian activities throughout the year, from race meetings to demonstrations of modern and traditional methods of riding, driving, saddlery, farriery and breeding throughout the last three centuries. Although some 2¼ hours away, many of our visitors choose a two week holiday visiting the Normandy Landing Beaches one week and then Le Mans home of Endurance Racing the second week. Remaining an extremely popular place to visit, the lure of Le Mans along with its unique motor racing history continues to pull crowds worldwide throughout the year offering a fantastic calendar of motor racing events notably the 24 hour endurance races for both sports cars and motorcycles. 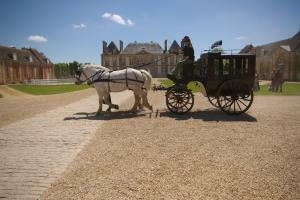 If preferred why not take advantage of our Partner Gites in the Le Mans area. 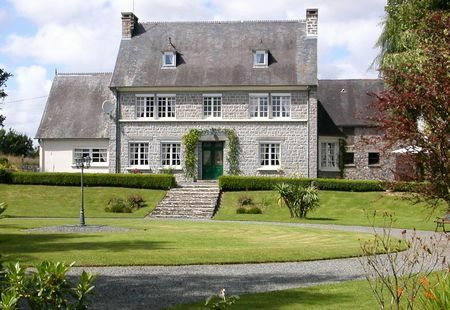 Combine two weeks back to back, one week in Le Mans and one week at Manoir de Saule in order to maximise your time spent on holiday in France. Attracting drivers from all over France and some from the UK, in our neighbouring village, we are pleased to announce as part of the National Hill-Climb Championship of France, the annual Hébécrevon Hill-Climb (5 mins). The event is held in May each year where both professional and semi professional drivers alike, put an impressive array of vehicles to the ultimate test with unbelievable cornering speeds on the ever winding rising road up towards the finish line in the normally sleepy village of Hébécrevon. For those more adventurous, why not have a go yourself. At 25 minutes drive away you will find our local FFSA approved Outdoor Kart Racing Track. With the opportunity to drive karts powered by 390cc engines at speeds up to 60 km / hour on a circuit of 1 km start to finish having a vertical drop and two technical corners depending upon your experience, each lap should take approximately one minute to complete. With ten minute sessions of great excitement, you are assured a most exhilarating day. Helmets and driver suits available for ages seven and upwards – try it for an unforgettable experience. St.Lo. (10 mins) has many shops, cafes and fine restaurants to suit all tastes and pockets. St.Lo. paid a heavy price for the liberation of France (June-July 1944) with 95% of the town being destroyed. You can still see and walk around the castle walls and gardens. The local Saturday market is well worth visiting, if only to taste some of the local produce. Islands of Jersey and Guernsey (1 hour) is well worth a visit. Daily ferries to and from the islands are generally available. Paris - why not have a day out in the romantic capital of France? Easily accessible by road (3 hours approx) or train (2 1/2 hours) from the station 15 minutes away. A wide range of outdoor activities including fishing, sailing, canoeing and wind surfing, horse and pony riding, walking / rambling and cycling out into the beautiful Norman countryside are all very popular along with wildlife watching generally out and about or at the regions wildlife sanctuaries and National Parks. For the very adventurous we have BUNGEE! at the famous AJ Hacket home of Bungee Jumping at Viaduc de la Souleuvre (La Ferrière-Harang 30 Mins) including their swing and scable, flying fox and luge hair raising activities. Finally - Not forgetting things for Children we are within easy reach of many safe sandy beaches, the Zoo (Parc Zoologique de Champrepus 40 mins), Alligator Bay (50 mins), a large and beautifully detailed Miniature Railway (55 mins), Parc Festyland (50 mins) City of the Sea, local swimming pool, bowling alley and so much more. For more information on any of the above, please send us and enquiry and we will do our best to assist you with what you require.